Sushi rice is short grain rice, though I didn't know that today when I was at Fred Meyer's shopping for our sushi dinner ingredients. Turns out it doesn't matter much. We made sushi rice with jasmine rice and it was just fine. I think that's really the nice thing about sushi---it's very forgiving. You can put pretty much anything in it and you can really get away with a lot before you mess it up too badly. It will still taste good. Stir 1/4 cup rice vinegar, 1 1/2 teaspoons vegetable oil (optional), 1/8 cup sugar and 1/2 teaspoon salt together over medium heat just until the sugar dissolves (or microwave for 30-40 seconds). Let mixture cool and stir into just cooked rice. Let some of the liquid evaporate before using the rice. * I started with 1 cup rinsed, uncooked rice which will give about 3 cups cooked rice. This was enough for about 5 rolls. ** How to make (vegan) sushi at home coming soon! I never really liked shortbread, or at least I didn't think I did. I have faint childhood memories of tins and tins full of tongue-numbingly similar cookies in different shapes--though I do maintain that the ones with big sugar crystals tasted better than the plain ones. (Those might have been butter cookies for all I know--apparently, the main difference is the addition of an egg.) I do specifically remember that my dad used the old tins to store his shoe polish in the garage, but that's pretty much the extent of my interaction with shortbread. Until a few months ago, that is. I must have been really hungry, because I ended up eating a small package of shortbread cookies that happened to be lying around one day. Before tasting those Walker's shortbread cookies that day, I'd always thought, "Shortbread--what's the point? There's no chocolate, no peanut butter, no nuts. This is one bland, boring cookie and I don't have time for cookies like that." Well, I was wrong. The shortbread was amazing. It had such a satisfying texture and a rich, buttery sweet, but not too sweet flavor. I was really converted when I friend of mine made a batch of shortbread cookies from scratch. Fresh baked shortbread, holy cow! I immediately added it to my list of recipes I needed to try. The really fascinating thing about shortbread is that it only uses four ingredients: flour, sugar, salt and, most importantly, butter. You can really taste everything you put in these cookies, so use the very best quality you can find and afford. Because it's so straight forward, they are easy to make and the returns on your investment will be multi fold. Sift together flour and salt into a bowl. Set aside. In a separate bowl, mix the butter with an electric mixer on medium (use the paddle attachment if you are cool enough to have one) until fluffy--3 to 5 minutes, scraping down the sides of the bowl. Using plastic wrap, press the dough into a buttered 10 inch tart pan (I only had 9 inch glass pie pan and that worked just fine...) With plastic on dough, refrigerate 20 minutes. With a few minutes to spare, adjust oven rack to the upper third. Preheat your oven to 300 degrees. Remove plastic wrap and cut out a round from the center using a 2 1/4-inch cookie cutter (I just used the rim of a glass). [Martha says to discard it, but I put in on a separate pan and cooked it too! Why waste cookies?] Put cutter back in center (or not, like me). Cut dough into 8 wedges using a paring knife. Prick the dough all over with a wooden skewer at 1/4-inch intervals. Bake until golden brown and firm in the center, about 1 hour. Transfer pan to a wire rack. Re-cut shortbread into wedges. Let cool completely in the pan. There are also many variations on shortbread--t's a nice base for other flavors. My next batch is going to be lime, white chocolate and almond shortbread. Oh man, I can't wait. We made taco salad again last night, and I decided to 'just say no' to the taco seasoning packet. Allrecipes.com came in handy yet again, and I found this recipe to season my meat with, and it was much tastier and flavorful than McCormicks. The boys oohed and ahhed over it. These are my favorite croutons! First you start with fresh sour dough french bread. A really good quality loaf. Slice it up into little cubes. You can do small or medium or large, it all depends on your style. Sometimes I make large and small if I'm doing soup and salad. Small for the salad, large for the soup. These are practically your garlic bread and croutons all in one. Blend until super creamy. Feel free to add more oil if it's thick. It needs to be runny. Put all of your cubed bread in a large plastic bag without any holes. I use a garbage bag. Then pour the buttery-oily-garlicky mixture over the bread, twist the bag closed at the top leaving some air in the bag (like a balloon). Then SHAKE, SHAKE, SHAKE! Once everything is coated spread them evenly on a baking sheet and bake at 375 for 10-15 minutes, check regularly, toss as needed. Once they start to brown, it will happen quickly so stay close, take them out and let them cool. You'll be tempted to eat one right away. Trust me, even after you blow on it for a minute it will still burn your mouth. I have to learn this lesson EVERY TIME, so maybe you can learn from my experience. Just wait another minute, and dig in! They can be stored in a ziplock bag for a while once they have cooled completely. *If you are still using table salt in your home do your food a favor and replace it next time you're at the store. Buy some sea salt (you can even get it in bulk sometimes) and keep a little bowl in the kitchen ready to offer you a pinch any time you need it. At the very least replace your table salt with kosher salt. After a little while you'll understand and never go back. This is another dish I made for our Easter BBQ yesterday. It was very delicious, and a great alternative to a standard lettuce salad. 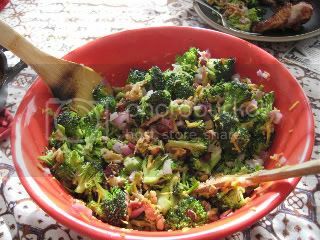 It's the first time I made it myself, although my Mom always made a great broccoli salad. I added and substituted a couple ingredients from the standard recipe, and I recommend you do the same thing, depending on your tastes. Creamy salad dressing - I used creamy poppy seed, which Trader Joe's just started carrying, otherwise Brianna's is the original brand. Combine all the ingredients and eat! If you can, it's best to let marinate in the refrigerator beforehand. I made this yesterday for Easter while BBQing with friends. It was so easy and really quite delicious - not too sweet, and very light and fluffy. Much better than the box of Jiffy I am used to. Thanks to Allrecipes.com for this one! Preheat oven to 400 degrees, and lightly grease a 9x9 baking pan or cast iron skillet. In a mixing bowl, stir together the dry ingredients. Then make a well in the center of the ingredients and add the rest of the wet ingredients and stir to combine. Bake 20-25 minutes until a toothpick inserted in the middle comes out dry. Drizzle honey on top for extra sweetness. Andrea asked about honey butter, and apparently it's easy to make. Just whisk together soft butter and honey. 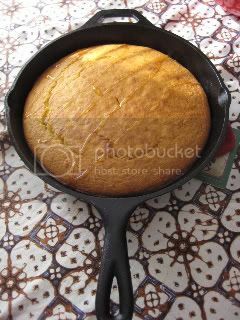 It is delicious on cornbread. I will try making it next time. Pudding--it's surprisingly easy to make from scratch and it's sooo much better than Jell-O. I served this version--an amalgamation of a couple of Bon Apetit recipes with my own spin--at a Mexican-themed dinner the other night. I was really surprised how well it went over--I didn't realize that people love pudding so much. It's definitely an underrated dessert. Whisk sugar, cornstarch and espresso powder in a heavy medium saucepan to blend. Turn to medium heat and gradually whisk in the milk. Constatnly whisk until the mixture boils and thickens, around 3-4 minutes. Remove from heat. Whisk in chocolate chips, butter and vanilla extract. Stir until smooth. Divide mixture among 6 small ramekins or glasses. Cover and chill pudding until cold, at least two hours. Mix the cream and vanilla in the chilled bowl. In a separate bowl, whisk together the powdered sugar and cinnamon, making sure to break up clumps in the sugar. Add the dry ingredients to the wet and beat until soft peaks form. Add more vanilla, powdered sugar and/or cinnamon to taste. Continue beating until raised peaks form and hold their shape. *Add dollops of cinnamon whipped cream onto pudding just before serving. Dust with a light sprinkle of cinnamon. *You can keep the whipped cream covered in the fridge for a coule of hours, until you are ready to use it. If it's left for too long you may need to briefly beat it again.